It is with a heavy heart that I sit to write this, because it was inspired by a recent incident in Calgary. In that incident a homeless man was eating in a local restaurant, having had a meal paid for by others. The story is a bit murky, but apparently he became a bit disruptive, and an employee at the restaurant asked him to leave. While I understand asking any disruptive patron to leave it was the words apparently used that trouble me. The employee told him to leave because he was dirty, smelly, and "looked offensive". When I heard this story my heart shrank, because I have spent time with the homeless in our community. I have heard from them how they suffer from the unkind words and looks of others, and how their dignity and self-respect is weakened by the stones others throw. I have listened to their stories, and I have heard the pain in their voice. And while my heart shrank something else happened, too. I became angry. Last year I had the chance to spend some time at a local event called "Homeless Connect". While there I met a young man named Adam, and I wrote about my encounter with Adam in this very blog. A couple of weeks ago I heard from Adam again when he tracked me down on Facebook and left me a message. With his permission I am sharing it here with you, and I will be sharing it on my Huffington Post Alberta blog as well as this goes far beyond the borders of this community and right into the great wide world. Adam explains homelessness far better than I ever could, and he understands what respect and dignity mean more than I ever will. I'd like you to read his unedited words. I just thought i would let u know that I would have read it sooner but i just got out of the pen. Looking back on your stories gave me a rush of memories. I "wasted" 5 years of my life in and out of jail and living on the streets of Fort McMurray. But looking back now I believe it was all part of gods plan for me. And although to some it may have seemed like such a big waste of 5 years, Id gladly do it all over again. That sense of family and struggle that u write about cant possible be described in words (but you came close). I believe that in those 5 years i may have lost out on lots of money but i became rich with character and wisdom that take some people a half a lifetime to acquire. I met idiots who would give me nothing but harsh words when i asked them for spare change, and i also met people with a golden heart (similar to yours) who would give me a $20 bill and smile while they did so. I remember my first winter on the streets i would sleep in the stairwell of "HeartStone Manor" after about a week every time I woke up there would be a sandwich and juice box tied to the railing in a clear bag next to my head. At first i was suspicious (one thing u learn off the hop when your homeless is not to trust anyone) A week after i awoke to an old lady tying the sandwich bag to the railing. She looked down on me with love in her eyes and apologized for startling me awake. She stayed and talked with me for awhile about my life and the why and hows of my homelessness. Then at the end our conversation she gave me the biggest hug and whispered in my ear "God Loves You"
Now mind you for every one "act of kindness" i encountered there's about 10 stories of people treating me like scum. But the point is this; there are good hearted compassionate people in this world. People that don't have to think twice about where they will be going in the afterlife. And before becoming homeless i had no clue they really existed i thought they only existed in movies and PR articles. Aside from family i could never fathom someone treating me kindly without wanting something in return or having an ulterior agenda. So I'm writing you to say Thanks! Thanks, for bringing attention to the Homeless and helping others see through their eyes, Thanks, for asking questions that mattered and were said in terms that provided dignity and removed prejudice. And most of all Thank You for taking the time to experience and understand something that not to many people would deem important. I'll be sure to book mark your page now and read it often and try to bring it to the attention of other McMurrians'. Because even though I have to live in Edmonton until my parole is up in April I plan on coming back to the Mac asap. It's been my home for 5 years and even though i was born and raised in New Brunswick, I "Grew Up" in McMurray. And when I get back there I'm definatley not gonna be homeless but, I will never forget about them either. When you read the words from Adam, what do you see, people? Do you truly see anyone different from yourself? I don't. There was a time in my life, in my twenties, when but for the help of my parents I could have ended up homeless, too. There were times I could have taken the wrong path, or made the wrong choices. There was a time when I could have been in dark places dependent on the angels of this world to not only survive, but to find hope that I could survive at all. When I received that message from Adam a few weeks ago I cried, because I do not think what I did should be unique or special or even noteworthy. All I did when I met Adam was to try to understand the plight of another human being, to see the world as he saw it, and to try to put myself in his shoes, even if just for a moment. When did we lose this ability? When did we stop being able to see with compassion and love and understanding? When did we begin to think it was okay to treat ANY human being with less dignity and respect than we would afford to another? I'd like to think the incident in Calgary was just one employee in one restaurant, but sadly I have heard similar stories from the homeless here. I'd like to close, though, with another story, one that gives me hope. A few years ago, before I started this blog, I was in the McDonald's in Wal-Mart. It was around this time of year, too, and my then much younger Intrepid Junior Blogger and I had stopped in for some supper after some gift shopping. The restaurant was fairly busy, and at one of the tables was an older gentleman - a little unkempt, a little dishevelled, and, I thought, likely homeless. He quietly ate his food, but towards the end of the meal he became a little agitated, throwing his food wrappers and muttering loudly to himself. I saw the restaurant manager approaching and I felt apprehension, fearing she would likely ask him to leave, and I worried about the impact this scene would have on my daughter, who I have worked so hard with to understand the concepts of respect and dignity. It brings tears to my eyes even now to think of how wrong I was. The manager approached the man, put a hand on his shoulder, said his name, and then said "You seem to be having a bad day - do you want to talk about it? Can I help you?" - and the man quieted quickly, comforted by the simple touch and compassion of another human being who instead of pushing him away during a bad moment reached out to him. I sat there absolutely silent, in awe of this beautiful tableau unfolding in front of me, a uniformed McDonald's manager and a homeless man, separated by some things but connected by the very essence of who we are - human. When we left the restaurant I stopped and thanked the manager for her kind treatment of the man, and she explained that he was a frequent visitor. I still had tears in my eyes when I thanked her, and on our way out I looked at my daughter and realized that what she had seen was one of the most magnificent things I could ever hope for her to witness. I realized that it gave me hope for the compassion present in this this world, and for the good we can do for others, regardless of their lot in life. This week when I read the story about that restaurant in Calgary it became all tangled together with the story from McDonald's and the message from Adam. It resonated in my heart and head all night and I knew this morning I had to write about it, to get it out, to impart a little bit of what I have learned. And what I have learned is this: every person on the face of this planet wants one thing - their dignity. It does not matter if they are wealthy or poor, educated or illiterate, young or old. All we want is to be treated as they would wish to be treated if they found themselves in our shoes. 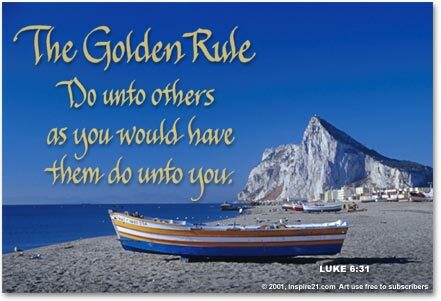 All we want, in the end, is the Golden Rule. It is such a simple rule, too, and if we follow it I can only imagine the compassionate, kind, understanding, and wonderful world we will create - together.